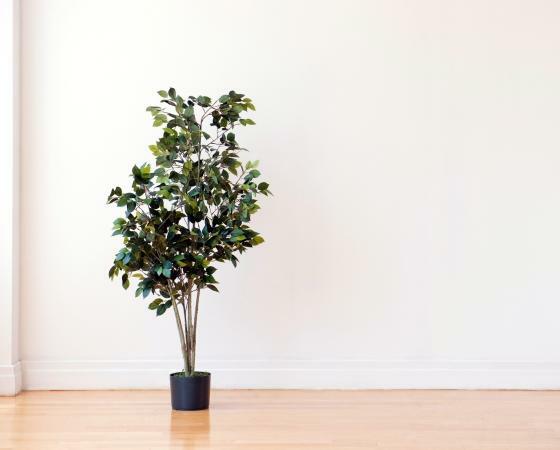 With more than 800 species available, ficus trees are one of the most popular decorative trees grown indoors. However, they are also rather sensitive plants, so get tips on how to care for them properly and help them thrive. Ficus trees are part of a classification of woody fig trees that exist naturally in tropical or temperate climates. Their lush, richly colored foliage, along with the fact that they are easily trained into desirable shapes, makes them one of the most common indoor tree varieties for both novice and experienced houseplant enthusiasts. The weeping (Ficus benjamina) in particular is one of the most popular species. Caring for ficus trees requires constant vigilance because these plants can be very sensitive to environmental conditions and changes. Properly cared for, they will easily flourish and can provide years of beauty to complement any home décor. Caring for any houseplant starts long before the plant takes up residence in a kitchen, office or den. From properly choosing the best plant to understanding why a ficus tree loses leaves, these tips can help keep your plant healthy and vibrant. Ficus trees have vigorous root growth and may easily become pot bound. 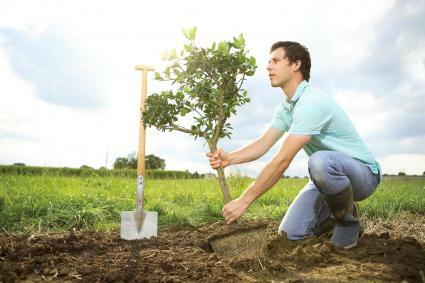 Replanting the tree is easy, and should be done every one to two years depending on its growth. Choose a pot at least two inches wider in diameter than the previous pot to ensure plenty of space for the tree to grow. For many trees, this will need to be done soon after they have been purchased as they are moved to a new home. The single most important key to your ficus ongoing health is where you place the plant. The tree should be placed in a location that receives some bright sunlight during the day, but it should not be in full sun all day long. The optimum temperature range is between 65 and 75 degrees Fahrenheit. Do not position the plant next to heaters, vents or windows that can create widely varied temperatures. Since ficus trees are native to more humid climates, they require careful watering and humidity control for the best growth. The soil should be kept moist but not wet. Place a saucer under the pot to provide extra drainage which will help prevent root rot. The tree should be watered after the top inch or two of soil has dried. Mist the tree gently once or twice daily, particularly while it is young or if it is adjusting to a new location. This can help it maintain its humidity. 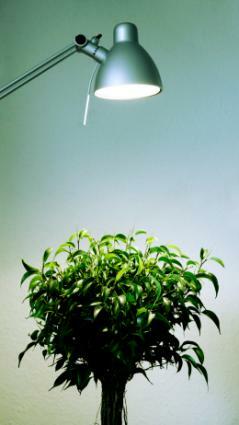 In extremely dry homes, adding a room humidifier can help adjust the humidity level to match the ficus tree's needs. Leaf loss is typically the first sign of stress a ficus tree exhibits, but proper care can help minimize any problems. It is not uncommon for a tree to lose one-quarter of its leaves even after a simple environmental change such as switching rooms, but proper watering and temperature regulation can help mitigate additional stress. If the leaves turn yellow just prior to dropping off, it is a sign of over-watering, while dull leaves may indicate a lack of essential nutrients. Your ficus will need to be fed regularly to keep it healthy. Use a guaranteed analysis 10-10-10 slow release fertilizer. Apply it at half the strength of the average recommended dosage to reduce the chance of burning your plant. Apply it once a month during active growth, which is typically from spring through fall. Ficus trees are seasonal plants and have different growing cycles for different times of the year. During spring and summer, the trees grow more quickly and require more water, fertilizer and sunlight to stay healthy. When nighttime outdoor temperatures remain above 50 degrees Fahrenheit, these trees may be placed outdoors for the summer in a bright, sunny area where they can take advantage of natural humidity and rainwater. In late autumn and winter, as the days grow colder, the growth slows down. Less water and fertilizer are required during cooler seasons. The term Hessian wrap is one of the names used for US burlap. This coarsely woven fabric is typically made from jute and sometimes sisal. It can also be found as a blend with other types of vegetable fibers. The term was coined to describe the rough coarse burlap uniforms worn by Hessian soldiers. Burlap, jute and Hessian wrap are interchangeable terms. Many root balls are wrapped in Hessian wrap (burlap) to ensure the dirt surrounding the roots stays intact. You'll want to remove this when you plant your tree either in the ground or in a pot or planter. The wrap will confine the root system and prevent the ficus from growing. Some nurseries wrap the trunks in Hessian wrap when shipping, especially during cold winter months. You want to remove this wrap before you pot the tree. If you're planting outside, you may need to leave the wrap if the temperatures are freezing or otherwise colder than your tree tolerates. In such an instance, you may want to pot the tree and wait to transplant outside in the spring. If you decided to plant your ficus tree in the yard, then you should remove the Hessian wrap around the root ball. If this proves too cumbersome, you can make several cuts through the burlap to expose the root system and allow it grow beyond the burlap. Never plant your tree with the root ball completely bound up in the burlap. While the fabric is biodegradable, it doesn't decompose quickly, and your tree's root system will be stunted or damaged from the confinement of the wrap. If you opt to remove the entire wrap, save it and cut into strips to spread around the base of the tree for an excellent mulch. If you plant your tree outside, you want to first be sure it can survive the temperatures of your region by verifying its hardiness zone rating. If the weather is unseasonable too cold for your Ficus tree, it needs to be wrapped for protection. This can also be done to protect your tree from severe winds. If your tree is taller than eight to nine feet, you'll need to construct a shield to cover the entire tree. To protect your tree from cold and/or wind, you can wrap the trunk with Hessian wrap, working your way from the bottom up. You can tie some twine around the wrap to better secure it against the wind. Water your tree when you're finished before the freeze. Be sure to add mulch around the base of the tree, leaving a couple of inches around the trunk clear. Once the danger of cold weather or windy weather has passed, you can unwrap the tree, first by cutting the twine and then unwrapping the burlap by starting at the top and working your way down the trunk. Prune and shape the trees in early spring just as the growing season begins. 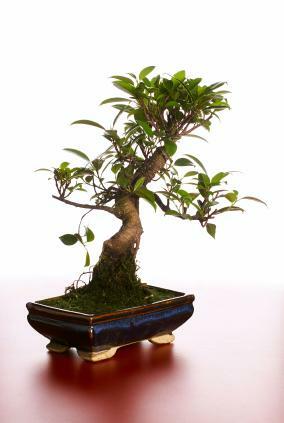 Ficus trees can be groomed into bonsai if desired, using both buried and exposed root designs. Wipe the dust off the tree's leaves regularly to keep the pores clear so they can absorb humidity more easily. Do not use wax-based cleaners on the leaves because it clogs the pores. Don't shy away from bringing home a ficus tree just because the plant is a bit temperamental. Following these care tips will keep your tree healthy and vibrant throughout the year and bring a bit of the outdoors into any room you choose.